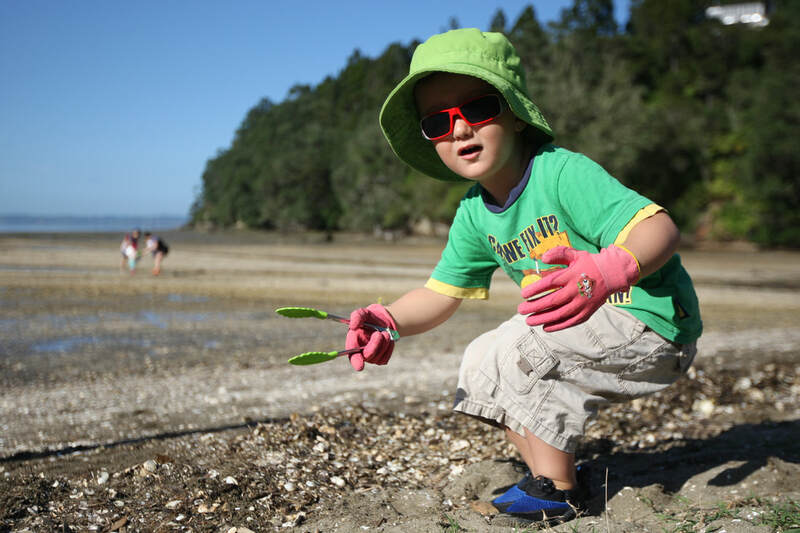 Enthusiastic 3-year-old Felix Hutton from Blockhouse Bay looking for rubbish on Titirangi Beach. To celebrate Playcentre Awareness Week and Seaweek in March, whānau from Blockhouse Bay and Titirangi Playcentres organised to clean up Titirangi Beach on a sunny Monday morning. Fifteen eager families gathered to hear Oliver from Sustainable Coastlines talk to us about why it is important to “look after the things we love”. Our children were able to tell Oliver that plastic, straws, and wrappers were all rubbish, and that “everyone should put their rubbish in the bin”. Our children learned that plastic does not belong in the sea, and that rubbish can kill sea animals. We then set off on a hunt for a very special kind of treasure – rubbish! With gloves on, and tongs and rubbish sacks in our hands, adults and children alike fanned out across the beach in their search. Our children enthusiastically scanned the beach, with many shouts of success ringing out across the bay. In just under an hour we had collected over 50 litres of rubbish with everything from a broom handle and a large piece of black rubber, to uncountable tiny pieces of plastic being found. Driving through Connaught Street on the last weekend of February you may have noticed a lot more activity than usual. Local Scout campground Motu Moana played host to many packs of Keas, Cubs and Scouts who came together to celebrate the annual Founder’s Day, this year marking 110 years of Scouting in New Zealand. All 12 Scout groups from the Moanarua Zone attended this camp including our local troops Iona, New Lynn Sea Scouts, Orpheus Sea Scouts and Western Bays Sea Scouts. While the little Keas mostly visited each day to take part in the fun, the older Cubs and Scouts enjoyed the full immersion camping experience sleeping in tents and making their own food. The theme of the camp was “Elements: Water, Earth, Wind, and Fire”, with activities related to each element. For “Earth”, cubs had to transport ‘plutonium’ pellets (golf balls) from the spent reactor to a storage pit without touching them. “Fire” had them using a traditional magnesium fire rod starter and different forms of tinder. 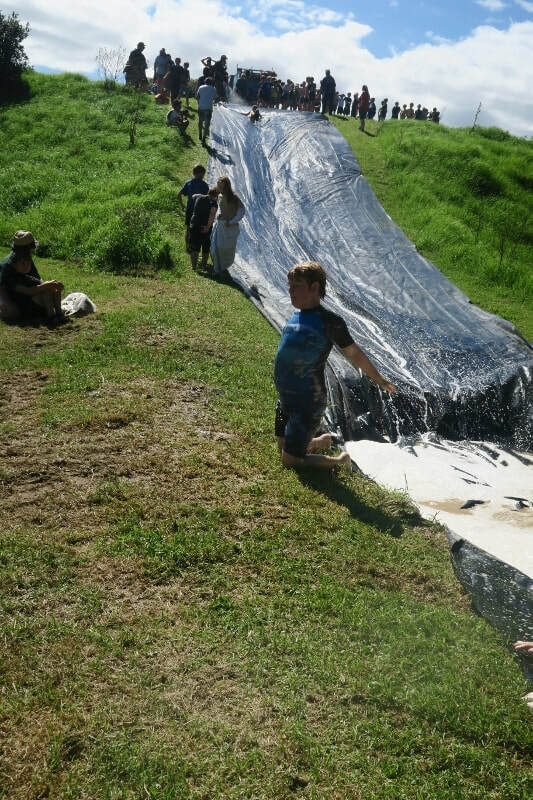 “Water” proved to be the favourite element with a dunking machine among the higher-ranked popular activities, and the ultimate highlight of the weekend - a mudslide down the large grassy bank. Iona Scouting pack had their own special highlight, with Iona Cub Symeon Dove winning the competition to design the Founder’s Day badge. The badge was awarded to all 400 or so participants, ranging from Keas through to Rovers and Scout Leaders. Well done Symeon! Your pack is very proud. Well-known Green Bay GP, Dr Morag Hardy, recently received the Queen’s Service Medal for services to paediatrics and the community and was honoured by members of the community at a luncheon last month. Dr Hardy first worked at Green Bay Medical Centre in 1972 when husband Dr Bob Hardy was away at his mother's funeral in Invercargill. She developed a more permanent presence in 1975, having previously been a Paediatrician in research. She had a special interest in those babies who were ‘failing to thrive’ and was a Paediatrician at the Auckland Karitane Hospital until its closure in the late 1970’s. 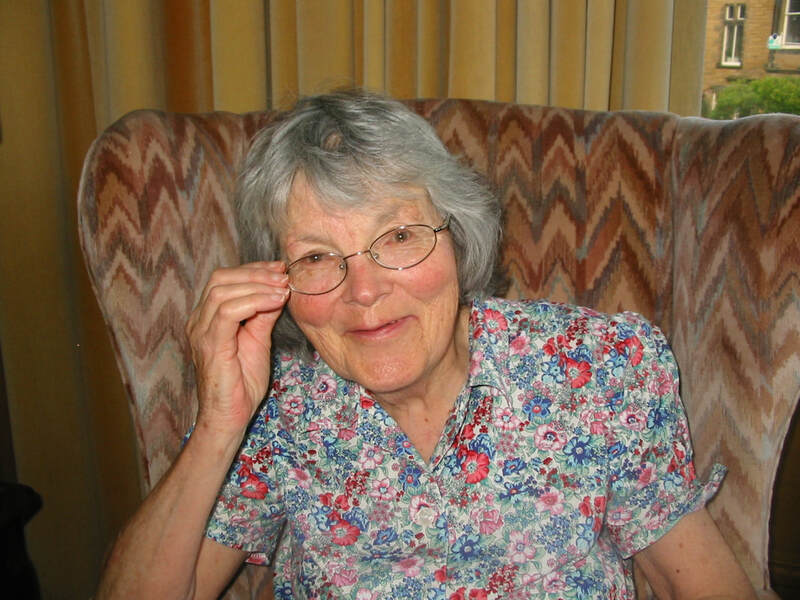 Noted for her work on infant feeding, Dr Hardy carried out a landmark five-year research study of malnutrition in 600 young children, which was published in the New Zealand Medical Journal in 1972. Dr Hardy was involved with Girl Guiding for more than 20 years. She would attend Guide Jamborees to provide medical care as a camp doctor. Dr Hardy was an elder in the Green Bay Church in the 1990s and ran the ‘Super Kids’ religious education programme at Green Bay Primary School for more than 10 years. Retiring in 2012, Dr Hardy was known for going beyond the call of duty for her patients, visiting them after hours, phoning them frequently to check on health issues and often waiving fees for patients on lower incomes. After retiring she remained active in the community, in her Church and activities such as Bible in Schools. Morag still retains a keen interest in the families of the area – many of whom were represented at the luncheon in her honour. Did you know that playing games is good for your brain, and a recommended activity for seniors? 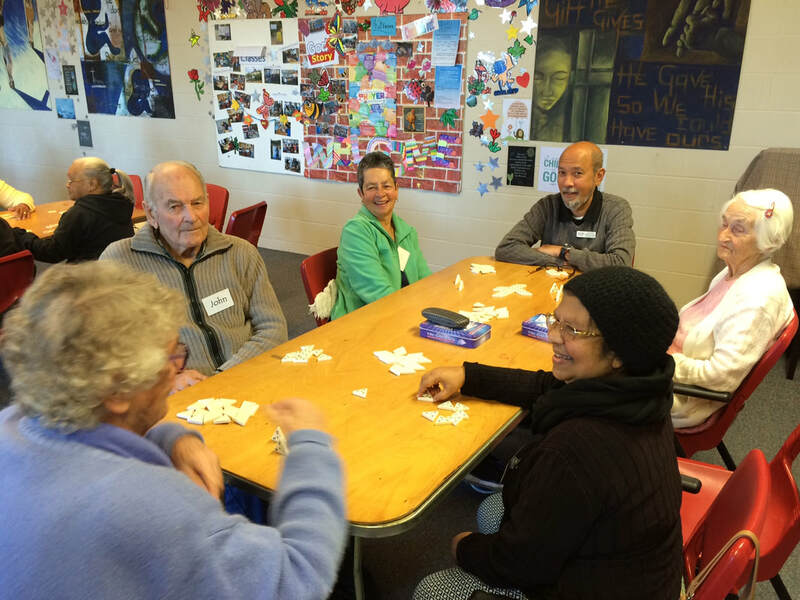 At Seniors at the Bay games are just one of the many activities on offer, fostering a great sense of community and connection. New Lions Jenny and Ayushi with their sponsors, Lions President Janelle and Lions Secretary Alan, take the oath from District Membership Leader Ricky Singh. 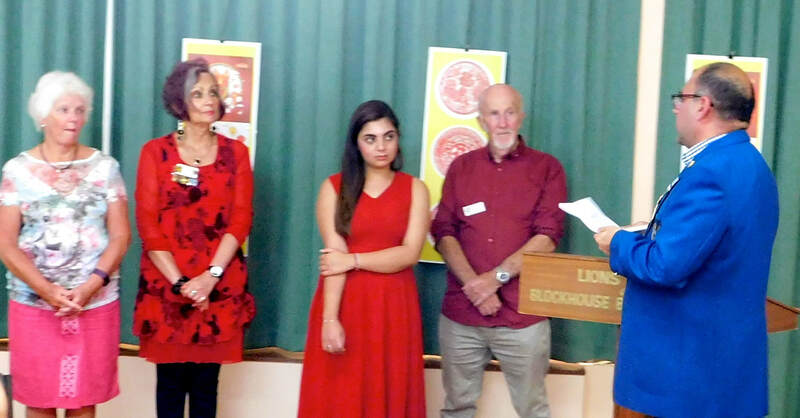 The Lions Club of Blockhouse Bay-Lynfield held a Chinese New Year Dinner recently with guest speaker Tina Chen giving insight on traditions and customs and how families through the ages get together during the New Year. During the dinner two new Lions Jenny and Ayushi were inducted with due ceremony to the club by District Global Membership Team Leader Ricky Singh. Since the 40th anniversary celebrations last August, the club has been enjoying a renaissance with an influx of locals wishing to make the local and world community a better place. Like-minded people joining together with a common goal can achieve so much more than one alone. Our local Lions support many initiatives to encourage youth, with school awards, speech and leadership competitions, sponsorship of worthy individuals and projects, help for children with mobility problems and now a Leo Club for students in a local school. The club meets twice a month; one for business and planning, the other for dinner and fellowship. The Lions motto “We serve” is the same throughout over 200 countries. The Blockhouse Bay Ladies Probus Club’s year has commenced with a programme of renewed interest for its members. At the AGM in March Shirley Shadbolt, who has been President for the past two years, handed over the reins to Georgie Anderson, and the committee elected to plan our meetings for the current year includes Vonnie Duffy, Merril Hogben, Olwyn Hume, Lynne Leaming, Lesley McCullough, Elaine Penn, Val Petrie, Ann Stankovich, Norma Taylor and Judy Thornley. The club was established in November 1993 and is mainly comprised of retired folk looking to extend their interests now they have a little more time to take part in extra-curricular activity. Over the years a wide variety of topics has been presented for its members who come from all walks of life. The demand for membership several years ago was such that a waiting list was created, and members had to wait for a vacancy to occur before membership could be enacted, but these days membership can be taken up straight away. Meetings are held at the BHB Community Centre on the second Friday of each month, commencing with formalities and morning tea followed by a guest speaking on a topic of local interest. On the fourth Friday of each month a coach outing is enjoyed to some interesting venues; usually in March a ‘mystery’ outing is arranged with the travellers’ curiosity being extended while en route to see who can guess the eventual destination. The committee of twelve meets at the beginning of each month to consider programme ideas, to present a variety of activities for our folk. Karan Kalsi has collecting a range of literally ‘outstanding’ achievements during his years at Lynfield College. In both Year 11 and 12 he was awarded the Lynfield College Merit Cup for Academic achievement, involvement in extra-curricular activities and school leadership. 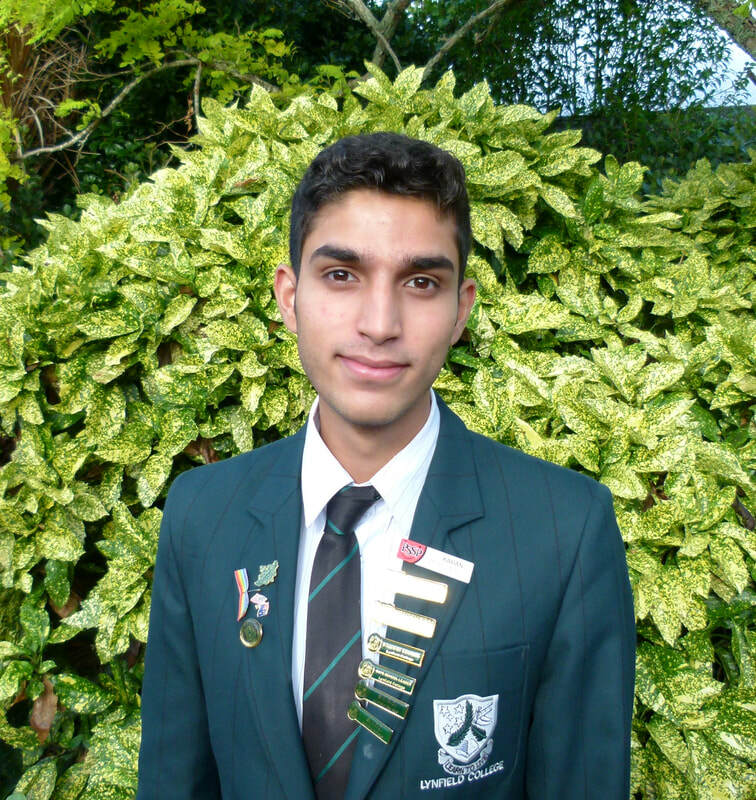 Karan has enjoyed unprecedented success as our most successful debater and has helped pave the way for the success Lynfield is now enjoying in the Auckland Schools' Debating and New Zealand Schools' Debating competitions. His talent and skill as a speaker saw him being the first student from Lynfield to be selected for a Russell McVeagh Auckland Regional team as a Year 11 student in 2015. He has consequently reached the Grand Final for Nationals three times, been awarded the Best Speaker trophy at the Auckland Regional Championships, and won both the Premier Junior and Premier Advanced Auckland Schools' Debating competitions for Lynfield. More importantly however, Karan has worked hard to establish a strong debating culture at Lynfield, and has supported his peers by coaching and mentoring young debaters, with great success. Karan has balanced not only a demanding Student Leadership role but also that of the Student Representative on the Board of Trustees along with the demands of an intensive academic programme. His hard work and self-motivation has seen him gain a total four scholarships in Classical Studies, History, Media Studies (Outstanding) and Geography (Outstanding). On top of this he attained first in New Zealand for Scholarship Geography and achieved an Outstanding Scholar Award, one of only 49 students throughout New Zealand to do so. Karan's energy and commitment have been outstanding and he leaves behind a fine legacy at Lynfield College. Amongst a range of future options Karan has also been accepted for Cambridge University. We will follow with interest his career pathway which is sure to be highly successful. The Whau Arts Showcase 2018 is a free event being held in Blockhouse Bay this May. Organiser, Jeremy Walters, a local designer and composer, is bringing together wide-ranging clubs, artists, photographers, dancers, singers, and musicians for the event. “The aim,” says Jeremy, “is to display the artistic abilities and multicultural diversity of the Whau community”. However, there are wider aims too. “I am working with the sponsors, the Whau Local Board, and the Bay’s Library to ensure that the event has a resonance in the community long after.” says Jeremy. One project supported by the event is two murals by the children of Blockhouse Bay Primary. After the showcase these will go on permanent display in the school grounds. The event will have fun and engaging workshops that are open to all ages. 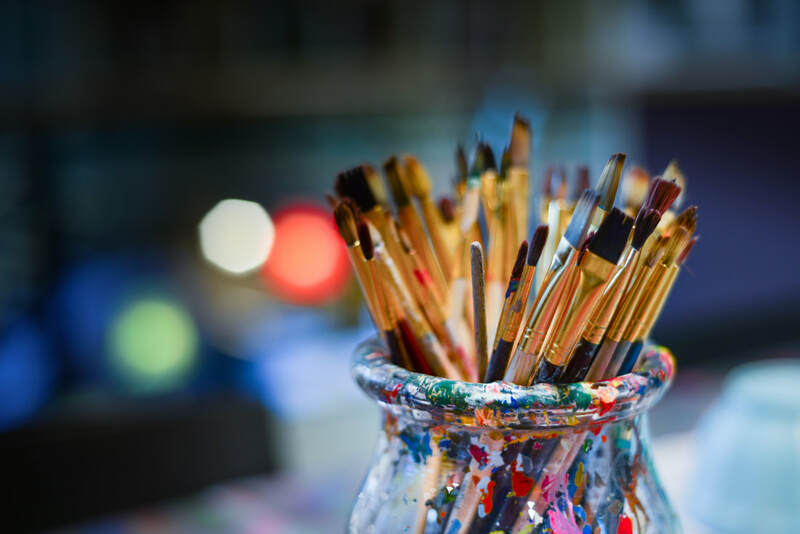 Art created here will be put on public display. This also will tie in with events at the Blockhouse Bay Library in June, and the Bays Arts Month in July. Artists and clubs using the event as an opportunity to increase exposure will also benefit from the long term aims of the Showcase, as eventually a small, loose community of artists, clubs, and community leaders develop into a support network that can grow together, and rally in times of need. 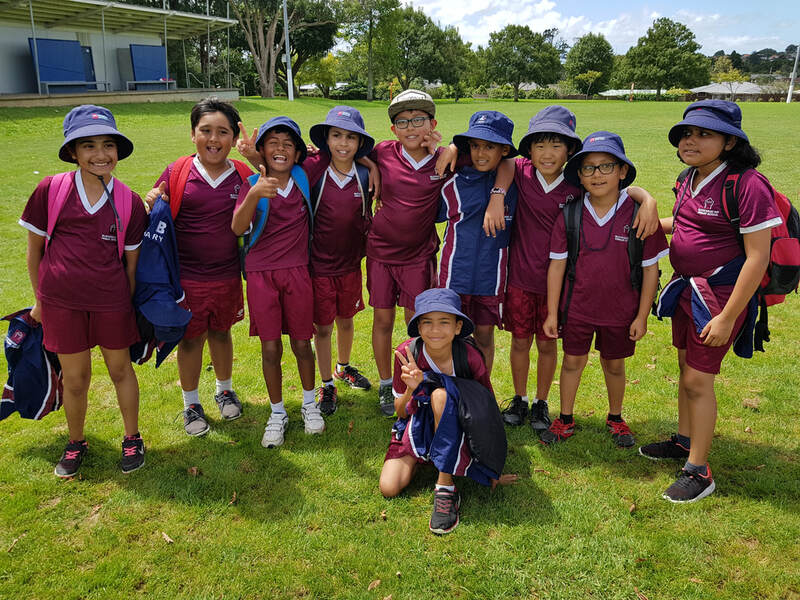 The annual Cricket Field Day run by Sport Waitakere was held in February at Eastdale Reserve. Nine schools from the Avon/Bay/Lynn Sports Cluster took part in the competition which was divided into A B and C divisions. Defending Champions Blockhouse Bay Primary fielded teams in all three, plus two strong teams in the A Division competition which included some players from last year’s championship winning team. Most players in the A Division also play club cricket for Suburbs New Lynn Cricket Club, resulting in a high standard of competition. In the A Division Final BHB Primary met Arahoe Primary. It was a closely contested match with Arahoe Primary eventually pipping BHB Primary. Most people do not need to file an Income Tax Return. This is due to the increased accuracy of PAYE (Pay As You Earn) tax deducted on wages and salaries, including pensions or superannuation. You do not even have to file a PTS (Personal Tax Summary) provided your income from interest is less than $200 and RWT (resident Withholding Tax) has been deducted at the correct tax rate. If you think that you might be entitled to a refund it is possible to file a PTS direct online with the IRD at www.ird.govt.nz. There are also some companies advertising that they can help you claim tax refunds for a percentage of your refund. You are in “business” eg have schedular payments (formerly Withholding Tax). You have income from overseas. Always use a Chartered Accountant or CPA for professional assistance as anyone can call themselves an accountant regardless of their lack of qualifications. If you are unsure of your filing requirements or want assistance with completing your tax obligation, make an appointment to see how we can help. Contributions from our community as well as regular columnists make this issue so interesting!